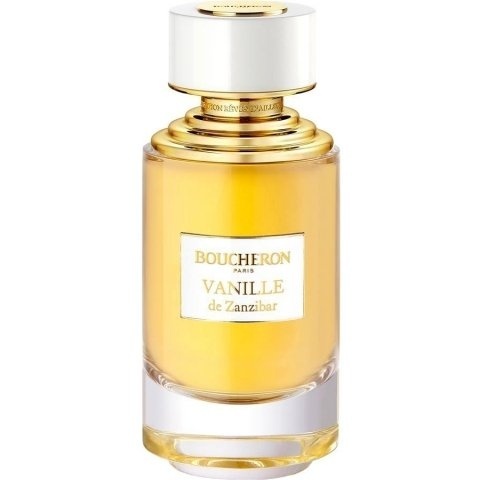 Vanille de Zanzibar is a popular perfume by Boucheron for women and men and was released in 2017. The scent is sweet-gourmand. It is being marketed by Inter Parfums. For decades I made a wide arc around vanilla scents: they were just annoying! So now my astonishment is naturally large, since I feel very well for some months now with the various creations around this pod. I think only of "Vanilla Absolument" by L'Artisan Parfumeur: an intoxicating mixture that I could eat with a spoon! The delicacy of "Jour de Fête", which L'Artisan Parfumeur already hints at in the pale pink of the bottle. Or the five elf-like vanilla creations by Sylvaine Delacourte, which enchanted me thanks to Alöx and which animated me in their differentiation to five commentaries. 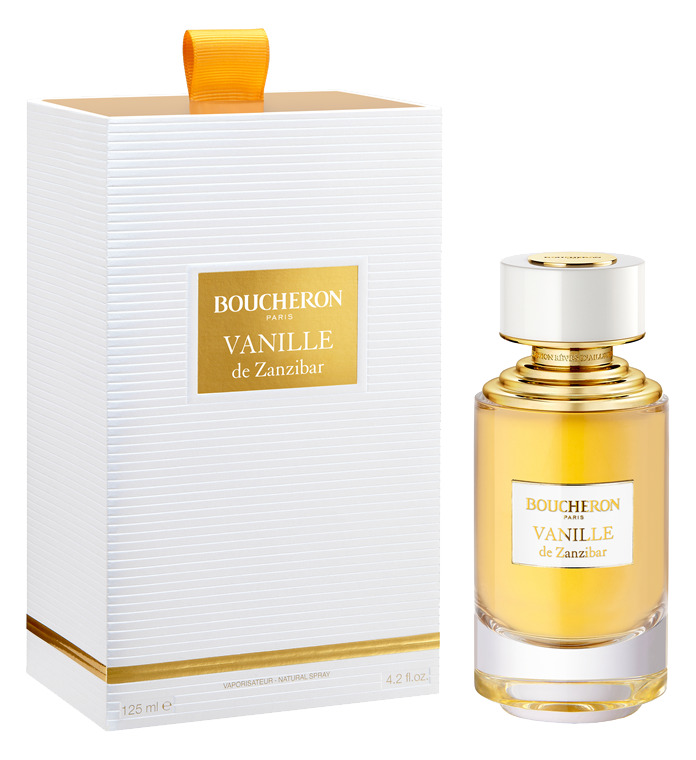 Every single one of them deserves it Annick Goutal's vanilla goddess conquered me quickly and persistently and now comes "Vanille de Zanzibar" from Boucheron: a brand with which I already feel very comfortable. The pyramid alone arouses curiosity! Here vanilla shows itself once again in one of its many facets: creamy white, creamy and generously embracing as usual, but with a fine fruity note. Pear and Jasmine - what a dream couple! The delicate, light pear aroma is surrounded by the fragrance of large-flowered jasmine. Ripe, light yellow pears nestle here against the large, fragrant jasmine blossoms; the dark green foliage completes a beautiful still life that could well be bedded on a layer of heavy creamy white velvet. Mandarin delivers sparkling freshness without biting too much or bizzing before the heart note reveals itself in intoxicating beauty. Wrapped in heavy wool-white luxuriant pleats, the sensory warming, all-possessing vanilla absorbs. It is supported by the dark violet vanilla flower, which is not sparing with its fragrance: a horn of plenty full of additional sensuality is poured out here! Still not enough of the vanilla-like fragrance: Peru balsam occurs! It always shakes me lightly when I imagine that this balm is caught in rags which are then boiled out. But anyway, the skin thing is the effect! And he adds a very special nuance to this previous fragrance lady: balsamic, slightly bitter and ideally harmonizing through its ingredients benzoic, cinnamic acid and vanillin. Thus "Vanille de Zanzibar" does not only develop a slightly blossom-fruity sweetness, but also gets a hint of spicy resin. I see fine dark brown balm flowing into creamy white cream and thus drawing arbitrary patterns in it. Maybe like golden-brown veined white marble? Or better: aromatic-white nougat with light caramel marbling? But whatever the imagination may draw: white musk - here even fitting to my feelings - appears and is accompanied by the slightly scratchy sandalwood and the golden beauty of patchouli. Thus a truly intoxicating final movement is composed from all these valuable fragrances. The conductor has learned his trade and confidently conducts his fragrance orchestra! Boucheron's "Vanille de Zanzibar" turns out to be a vanilla fragrance creature that nestles against the skin in sensually flowing movements, conquers you and setstles down there lasciviously lolling for some time. As noble as this vanilla goddess is her presence: she is present from the very first pear fragrance, but never loud, never annoying or even felt sticky, even though she was born from syrup or cream. A refined candy that could be dedicated to the goddess Venus. "Vanille de Zanzibar" says goodbye elegantly and as light-footed as an air spirit: a graceful touch remains, reminiscent of hours lovingly spent together and still contains warmth. Write the first Review for Vanille de Zanzibar!